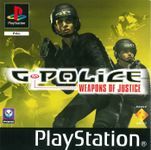 G-Police: Weapons of Justice is the sequel to the game G-Police, a vehicle-based shooter for the PlayStation. Produced by Psygnosis and released in 1999, this game picked up the story from where the first game ended, and provided three new vehicles and numerous new weapons for the player to use in the 30 missions. Source: Wikipedia, "G-Police," available under the CC-BY-SA License.